The sleekly cool Magnolia Lounge, designed by Swiss-born American architect William Lescaze for the Texas Centennial, is considered the first International-style building built in Texas, and though it feels perfectly at home in Art Deco Fair Park, it looks completely different and much more modern that the buildings around it. It was built by the Magnolia Petroleum Company as a place for visitors to the Centennial Exposition to relax and cool off (it boasted a 20-ton refrigeration plant). The Magnolia Company’s slogan for their building was “Be Our Guest and Rest at the Magnolia Lounge.” In other words, this was the most insistently fabulous rest stop ever built! How did we GET this cool building? Two words: Stanley Marcus. 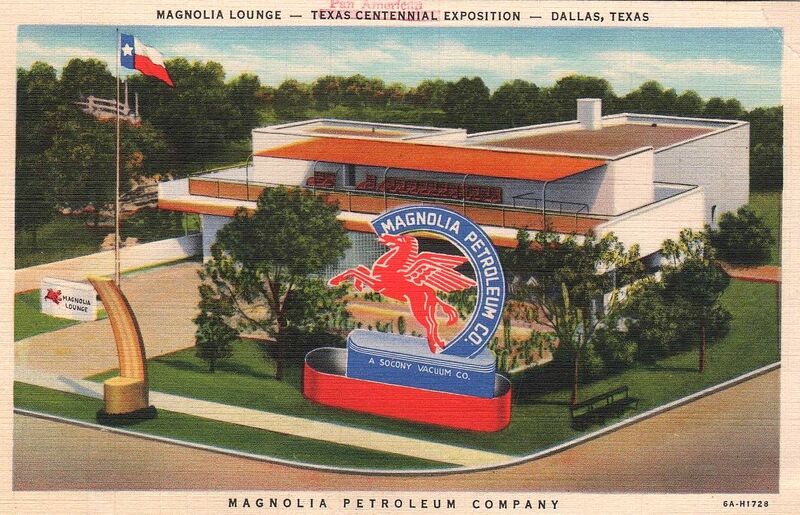 It was a popular oil company-branded “comfort station” for fair visitors until 1942 when the Magnolia Petroleum Co. (who had owned the building), gave title of the Magnolia Lounge to the State Fair, which used it for many years to house its general offices. 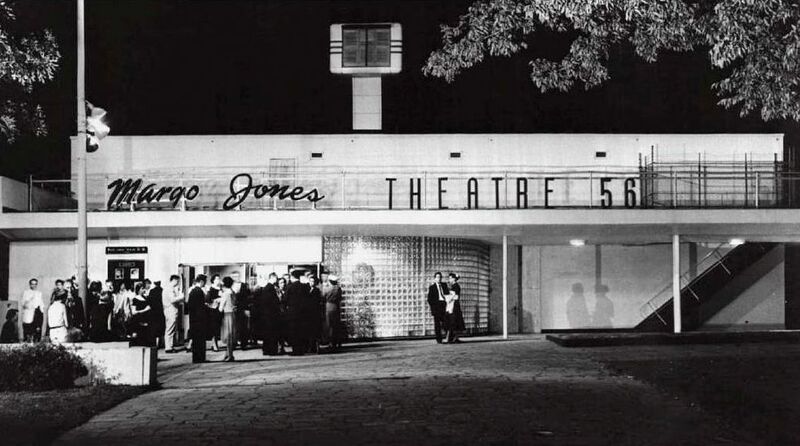 In 1947, the space became Theatre ’47, Margo Jones’ legendary regional theater where, among other achievements, she produced plays of a young Tennessee Williams and introduced the innovation of theater-in-the-round. After Jones’ death in 1955, the theater carried on for a few years but eventually closed in 1959. After some difficult lean years for the building (during which demolition was considered! ), it has been home to organizations such as the Friends of Fair Park, and it is now an active performance space again. And all is well with the world. Postcard of the Magnolia Lounge from the vast wilds of the internet. Click it. It’s huge. The Virginia McAlester quote is from a Friends of Fair Park advertising section in the Oct. 1989 issue of Texas Monthly. For more on the history of the Magnolia Lounge, see the official Fair Park home page here; also, check out the the City of Dallas page devoted to this building, here. And for more on this cool building, particularly in connection with Margo Jones, see the page on the always informative Watermelon Kid site, here. A lengthy description of the building can be found in the article “Daylight Movies of Texas Scenes To Reward Visitors to Magnolia’s Cool Lounge” (The Dallas Morning News, April 26, 1936). The Wikipedia page on architect William Lescaze is here. The website of the current incarnation of the Margo Jones Theatre, back once again in the Magnolia Lounge, is here. Click pictures for larger images (the top postcard is damn-near gigantic). I would be curious about this, as well.